We’d love your help. 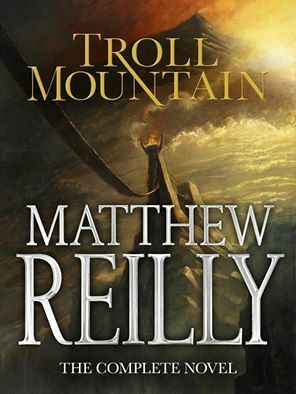 Let us know what’s wrong with this preview of Troll Mountain by Matthew Reilly. When his sister is struck down by the disease and hi A dauntless young hero. To ask other readers questions about Troll Mountain, please sign up. Are there any plans to publish this in book form? Jeff Correll Found the book at http://www.panmacmillan.com.au/ . I think this is a great read if you want something fast paced, quick to finish and not too in-depth. If you're an epic Fantasy buff, this isn't for you. If you don't normally read Fantasy (like myself) and want a good intro to the genre, this is for you. While it's written in a YA language format, it carries some heavy adult social themes so I found it easy to connect with. Great characters, great thrilling scenes and if you commit you could finish it in a day or a weekend. I couldn't finish it. This was a YA book written in a straight forward and uncomplicated manner. This is the reason I avoid YA novels. My experience has been that the tend to less complex with simple dialogue. While I was somewhat interested, I was ultimately bored. This is not really a knock on the book but an indication this book wasn't written for me. A great book for kids... considering adding this to my Literature Circles book collection! I've never heard of Matthew Reilly, but apparently he's a fairly big author from Australia. The buzz on the internet (based on other reviews at Goodreads and Wikipedia) is that he's mostly know for action thriller-type books, and apparently his books are well-researched and quite deep. That isn't the case with this book, Troll Mountain: The Complete Novel. That said, I get the impression that his other books are not young adult books, so maybe that's why. Originally written as a serialized novel (split into three parts), Troll Mountain is the story of Raf, a youth from a small village, and his quest to get an elixir for his sick sister. To get this elixir, he must defy his village elders and make his way to Troll Mountain, a mountain fortress guarded by...yes, trolls. The sickness (which turns out to be something like scurvy) has impacted not just Raf's sister but others in his village, caused in part because the trolls have dammed the river that feeds the village. They also claim to have come up with a cure for the sickness, but exact a costly price--one life in exchange for a vial. During his quest, Raf makes friends with a hermit, Ko, who is a wise elder figure. He also makes unlikely friends with a troll who was exiled from Troll Mountain, Doom. Together, the three take on the trolls and hope to save the day. Along the way, Raf also learns about stereotypes and about knowledge-seeking, and not taking everything you've heard second-hand at face-value. This book is a short stand-alone novel. It's a fairly generic, semi-predictable tale of an orphan boy on a quest to save his village. It does appear that the author has left some hooks in the book to write pre-quels and/or sequels, though. The world is setup as a fairly primitive land with a history where people seemed to be the humans of today. It also ends in a predictable manner but in a way that could explore "what happens next" if Reilly desired to re-visit this world. Throughout the quest, Ko tries to give Raf lessons about life, though it seems that sometimes even Ko doesn't follow his own lessons. For example, there was "common knowledge" that the mountains in the North went on forever, but when Raf realized they didn't, Ko didn't believe him and seemed shocked. This was a bit of a flaw in Ko's character and made him seem inconsistent. There was another lesson that Ko tried to impart, about the difference between cleverness and wisdom, that didn't really come to much fruition. The other "morals" that were fairly generically written all came back around by the end of the story. All in all, this was an ok book. It was too obvious what was going to happen, and the world nor characters weren't particularly well-developed. They ended up feeling a little flat, a little too predictable. More frustrating, the sense of struggle or real danger was never there while I listened. It seemed like Raf was going to get through every obstacle a little too easily, and his survival/success were never in question. I realize that it was written for a young adult audience. I think that if I'd read it when I was 9 or 10, it might have felt less flat, as I was a far less mature reader in general and longer books with numerous details would have probably lost me or at least, not been fully appreciated/understood. So, this is probably an OK book for a younger reader who's never read the genre and isn't looking for complexity. I'm not sure that I can really recommend it for experienced readers of the genre. This was a fast-paced, very straight forward fantasy quest following our young hero, Raf, as he seeks the cure to his sister's illness hidden within Troll Mountain. It read more on the younger-YA side (could even be middle-grade if you don't mind the troll fighting that goes on). Glad I read it. A good story - a recomended read... Some people may not like the simple story, but I found it a good read. বড় ভাই কি আসলেই বালাই? দুষট গরহ? জবলজযানত যনতরণা?? আর সেজনযই তো রাফ ছুটে গেছে টরল পাহাড়ে... নয়তো ছোট বোনটাকে বাঁচানো যাবে না যে!!!! বড় ভাই কি আসলেই বালাই? দুষ্ট গ্রহ? জ্বলজ্যান্ত যন্ত্রণা?? আর সেজন্যই তো রাফ ছুটে গেছে ট্রল পাহাড়ে... নয়তো ছোট বোনটাকে বাঁচানো যাবে না যে!!!! সবকিছুকে বৃদ্ধাঙ্গুলি দেখিয়ে রওনা দিল রাফ.. অজানার উদ্দেশ্যে। ভয়াবহ এক অভিযানে.... শুরু হল তার ট্রল পাহাড়ের দিকে যাত্রা.... যাত্রাপথে পেয়ে যায় কিছু সুহৃদ। তারপর? This is a wonderful, cathartic read. We follow Raf on his journey to save his sister. It has all the ingredients of a great fantasy fable with the addition of a lovely moral, one not usual to fantasy. I really enjoyed it, it was so easy to read and I really appreciated the lessons learnt by the characters along the way. This is amazing for Reilly's first attempt at fantasy in comparison to what he usually writes. Is he simply good at everything? Hopefully there is more fantasy to come, and hopefu This is a wonderful, cathartic read. It was a short read that is better described as middle grade, rather than young adult. It’s a fantasy story about a village who’s people fall ill (to scurvy), and a boy who sets out to find the elixir. It’s prefect for fans of “Rowan of Rin” and “Deltora Quest”. I completely LOVE every Matthew Reilly book I have read, which is why I am surprised that I didn't love this one as much as the rest. This wasn't bad, a solid 3 stars, but it moved VERY quickly over parts that could have used a bit more depth. For example, the abandoned hobgoblin home was discussed in such a way as to indicate that it was rather large and full of booby traps. We get to see ONE trap that was easily circumvented and they were through the place in a very short time, maybe an hour or I completely LOVE every Matthew Reilly book I have read, which is why I am surprised that I didn't love this one as much as the rest. This wasn't bad, a solid 3 stars, but it moved VERY quickly over parts that could have used a bit more depth. For example, the abandoned hobgoblin home was discussed in such a way as to indicate that it was rather large and full of booby traps. We get to see ONE trap that was easily circumvented and they were through the place in a very short time, maybe an hour or so? The book was a quick read and not too difficult on the brain to follow, though it did have a few philosophical points to ponder, nothing too earth-shattering was imparted. The almost complete genocide of the trolls, despite the fact that they were a dying race and a very brutish and cruel one at that, is kind of horrific in how their end was seen as a victory by the hero. It would have made more sense if the trolls were ALL depicted as evil and violent and unable to co-exist with their neighbors, but two of the main secondary characters were good and smart, though one was a bit dumber than the other. Also, there were two female characters, but they don't DO anything. They were the causes for the male characters to act. The females spurred the males to be heroes, but not on purpose. Bad things were happening to the females that they couldn't control and the males decided to help the females who couldn't help themselves. I'm not a rabid feminist, but I would definitely recommend this book to boys and not to girls. I like at least one strong female character and this book didn't deliver that. The MC DID grow as a person. He learned and was super physical in what he did, though honestly, if he was as poorly fed as it was claimed in the beginning of the book, I don't think he could have done HALF of what he did. Ok, ok, I think I'm being a bit too rational about a book that has trolls and hobgoblins in it. But I like my fantasy to be realistic, if that makes any sense. Not a horrible book, but more of a meh one. I would recommend it with reservations. Troll Mountain is a YA novel told in installments about a tribe of Northmen who live in the shadow of the foreboding Troll Mountain. Illness and famine have recently racked their small village and as the disease spreads, they learn that the Trolls hold the cure. A band is sent by the ruling family to gain the cure. The young man Raf is unique in his tribe and he sees that the ruling class of his village is no better than him. When his sister Kira takes ill he knows that he must act. On his own, he begins the journey to Troll Mountain. Along the way he finds allies in the outcast warrior Ko and the lost Troll Dum. Their quest into Troll Mountain is more than the mission to find the elixir to cure the disease but along the way Raf realizes that all the truths he had once known may have been lies to keep him in his place. The ruling families of the village may have been keeping the truth away from the rest of the village to keep their hold over all the others. Troll Mountain is written as a morality tale with heroic acts and betrayal on every page. Each character has moments of triumph and absolute moments of failure. The quest is a more of a journey to adulthood for Raf, whose acts must rise to the level of his thoughts and convictions. The pace of this novel, since it was written as a series of installments is sometimes disjointed and with out a sense of continuity. The author, Matthew Reilly, adult novels excel in pace and excitement so in this story I found this somewhat surprising. After reading 'The Great Zoo of China' and finding it highly entertaining I was really looking forward to reading this. A fantasy novel with trolls sounded exciting, but I was very disappointed. I like a good short book, but with this book I felt there could've been so much more. When it comes to Fantasy novels, I expect a long quest and while on this journey the hero has learned lots of lessons and grown along the way. But I didn't feel like this book delivered all of that. I wanted more world bu After reading 'The Great Zoo of China' and finding it highly entertaining I was really looking forward to reading this. A fantasy novel with trolls sounded exciting, but I was very disappointed. I wanted more world building and more of an adventure for Raf. The epic journey to troll mountain was more like a skip and a jump with one simple battle between the wolves and hobgoblins. Then everything that happened with the trolls and getting back home felt rushed. I really like the idea and think there is so much potential there. I wish that Reilly had spent more time fleshing it out and making each episode a bit longer. I enjoy his storytelling and think he could've done better. I initially rated this two stars but after thinking more about it I decided that it deserved more like three stars. In an interview Reilly said that he wanted to write a book that can be enjoyed by people of all ages and easily read on the train or in a classroom. I guess he has achieved that. As an avid reader of Matthew Reilly's novels (e.g Temple, Seven Deadly Wonders), this fell a little flat for me. Actually it fell more than a little flat - it was disappointing. It started off with promise but from then on, the plot was executed poorly. The main problem was with the dialogue and the writing though. I realize this is YA and that the language would be a little...simplistic but Troll Mountain was just completely dumbed-down. And I know Matthew Reilly could do better - there's a reas As an avid reader of Matthew Reilly's novels (e.g Temple, Seven Deadly Wonders), this fell a little flat for me. Actually it fell more than a little flat - it was disappointing. It started off with promise but from then on, the plot was executed poorly. The main problem was with the dialogue and the writing though. I realize this is YA and that the language would be a little...simplistic but Troll Mountain was just completely dumbed-down. And I know Matthew Reilly could do better - there's a reason I'm obsessed with his books. 2.85 stars. Because I still enjoyed reading the book even though towards the end, I felt like I wasted my time. This is quite a different book by Matthew Reilly and that's why I picked it up. Not the usual thriller, but rather a fantasy. The story is rather nice, very much your typical quest fantasy type thing. The hero's sister gets sick and he goes on a quest to get the cure from the Trolls. On his way he does, of course, find some unlikely allies. Matthew Reilly supplies this in his usual fast paced tempo and the, sometimes borderline silly, action scenes that are just beyond belief (and not always in This is quite a different book by Matthew Reilly and that's why I picked it up. Not the usual thriller, but rather a fantasy. The story is rather nice, very much your typical quest fantasy type thing. The hero's sister gets sick and he goes on a quest to get the cure from the Trolls. On his way he does, of course, find some unlikely allies. Matthew Reilly supplies this in his usual fast paced tempo and the, sometimes borderline silly, action scenes that are just beyond belief (and not always in a good way). I think because this book is so short I didn't have time to grow tired of them as I usually do. So I understand my shelving may not make sense when you can see I’ve only given it 3 stars. To be fair it’s more like a 3.5 star read but I’m not convinced enough to give it 4 stars. Now I would never willingly read about trolls (because eww, gross) but then it is Matthew Reilly, and I’ve read almost everything else by him so I figured why not. I wasn’t disappointed! As always his actions scenes leave no time for silly things like breathing or thinking. The map to Troll mountain and their solutio So I understand my shelving may not make sense when you can see I’ve only given it 3 stars. To be fair it’s more like a 3.5 star read but I’m not convinced enough to give it 4 stars. Now I would never willingly read about trolls (because eww, gross) but then it is Matthew Reilly, and I’ve read almost everything else by him so I figured why not. I wasn’t disappointed! As always his actions scenes leave no time for silly things like breathing or thinking. The map to Troll mountain and their solution was well thought out. Sure I wanted more traps, you know, the traps I was promised, but whatever, I’ll deal because this is was a quick fun read for me. I am a frequent reader of the Fantasy genre and also an avid fan of Matthew Reilly's action series'. However, the merging of the two was not what I had hoped it would be. This book read very flat and monotone as if written on a strict middle grade level. The action never reached the fever pitch I have come to expect from either this writer or the genre itself. This book just doesn't have anything to set it apart and it never pulls the reader in. It's a quick read and for the Young Adult crowd th I am a frequent reader of the Fantasy genre and also an avid fan of Matthew Reilly's action series'. However, the merging of the two was not what I had hoped it would be. This book read very flat and monotone as if written on a strict middle grade level. The action never reached the fever pitch I have come to expect from either this writer or the genre itself. Very similar hero adventure storyline to The Hobbit, The Talisman and The Dragon's Eyes. Pure but simple fantasy world of when trolls and clans men meet. Think Lord of the Rings meets Clan of the Cave Bear. More a young fiction novel, and a very quick read. Unfortunately I was too busy to read it in one hit but really wanted to. I think this is the first time I've ever given a Matthew Reilly book less than 4 stars. The three part story didn't really even start to hit its mark until part way through the second instalment and even then it never really found its footing, falling into far too many clichés. Advertised as a family-friendly story it perhaps should have been sold more explicitly as a middle grade novel. it is very rare fir me to rate a book five stars when the average rating is so low. but troll mountain deserves five stars. I suspect a lot of readers were looking for an action thriller like most of Reilly's other novels. this is absolutely not. It is a hero story and a fable. if that's what you're looking for, you'll love it. That's not the Matthew Reilly I am used with. I couldn't feel him in this book. It was more like a child adventure, than the usual dynamic and wild pace of Reilly. Not quite as engaging as The Great Zoo of China, I found myself a little bored for the first 100 odd pages. However true to Matthew Rielly's captivating action writing form, the ending kept on the edge of my seat. Yes is was a little predictable but still enjoyable. Overall, i found this novel quite enjoyable. In some aspects its just like every other typical Young Adult book, but in other ways its such a refreshing read that i highly recommend to everyone. A nice middle grade fable with Trolls, a bad human and a quest for a young hero in it. A fun read.